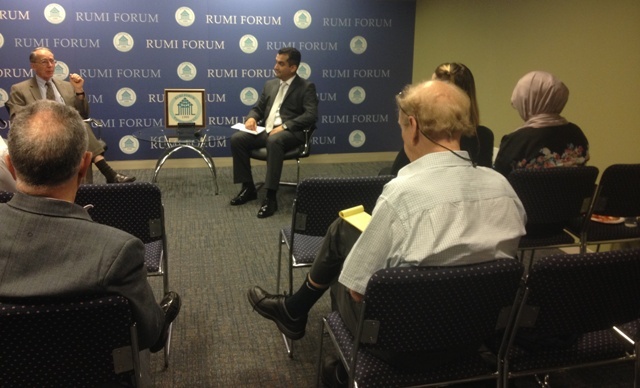 Ambassador Shinn, guest at Rumi Forum, discussed this evening the contents of his book on the Gulen movement in Africa. He commenced by outlining the book’s contents and indicating which topics he would be covering further in his discussion. The Ambassador’s book, not yet complete at the time of his discussion with Rumi Forum, is set to contain nine chapters, covering Fethullah Gulen, Hizmet and Turkish banking in Africa, Gulen-inspired education in Africa, Hizmet dialogue centers, Hizmet humanitarian activities, Gulen-affiliated media and public outreach programs, concluding with the relationship between Hizmet and the Justice and Development Party (AKP), the impact of Hizmet on Turkey-Africa relations more broadly. To delve into more detail, the Ambassador first turned to the topic of the connection between Hizmet and Turkish banking, stating that “Hizmet may be unique among global service movements in the degree it relies on the financial support of the business and industrial community”. To clarify, the Ambassador pointed out that most Hizmet projects, such as the construction of schools, are financed using the fees of the institution being established; however, in the interest of financing projects initially, Hizmet has fostered this banking connection. There is also an informal relationship between the Gulen movement and the business industrial confederation TUSKON (the Turkish Confederation of Businessmen and Industrialists). TUSKON is not formally part of the Gulen movement; however, like many Hizmet organizations, it participates in numerous activities in Africa, including trade bridges and forums, which the confederation has hosted both between Turkey and Africa and bilaterally. (In 2003, TUSKON organized the Economic Community for West African States Summit in Lagos.) In addition to this confederation, there are various Hizmet-affiliated local business associations operating in Africa. As with TUSKON, the affiliation between these associations and the Gulen movement is informal, though the movement enjoys widespread support among them. These associations, and their capital, often provide the Hizmet movement funding for various projects, such as schools (as Ambassador Shinn mentioned previously). Proceeding with the topic of Hizmet finances, Ambassador Shinn commented on the existence of Hizmet’s banking connections in Africa, including its relationship with the Islamic Development Bank, and its influence exerted through the Hizmet-created bank, Bank Asya. In addition to these banking connections, Hizmet has acquired some banking subsidiaries in Africa. These connections, both with business confederations such as TUSKON and with Islamic banking in Africa, are central to Hizmet’s operation in Africa and it’s projection of influence on the continent. Of Hizmet’s numerous projects, Ambassador Shinn chose for this dialogue to focus briefly on Hizmet schools in Africa. While researching for his book, he spent much of his time visiting these schools in an array of different countries. Interestingly, Ambassador Shinn noted that there is not currently accurate documentation of the number of Hizmet schools in Africa, though estimates indicate that there are well over 100, mainly elementary or mid-level schools (with a few schools offering secondary instruction). Nigeria currently operates the highest number of Hizmet Schools, and the only Hizmet university established in Africa. Ambassador Shinn shared that, notably, most Hizmet schools in Africa teach the national curriculum of the country in which they were established, using the national language, while also offering Turkish language instruction. Like Hizmet-associated business confederations and some banking institutions associated with the Hizmet movement, these schools do not maintain an overt connection to the Gulen movement. Though the schools do show signs of adhering to the movement’s philosophy, they do not (through establishment names, etc.) indicate their connection explicitly. Many of the Hizmet schools are fee-based, as Ambassador Shinn mentioned earlier in reference to many Hizmet projects. These schools, which operate similarly to charter schools, are generally considered of high quality. Typically, Hizmet schools cater both in their quality and their modes of discipline to children of local government officials and business people. The schools largely emphasize mathematics and science, earning them a largely favorable academic reputation. Also established in a number of African countries are Hizmet dialogue and cultural centers. Ambassador Shinn asserts that these centers are comparable to Rumi Forum, though they are generally less operational and well staffed due to their more recent establishment. As with Hizmet schools in Africa, no central listing of the number of these centers is available. Many of Hizmet schools and cultural centers are currently operating in Nigerian cities, such as Abuja, which experience issues with extremism and groups such as Boko Haram. In these locations, Hizmet organizations have striven to maintain a low profile, and make efforts to use their connections to the community to anticipate any possible resistance or violence from extremist groups. 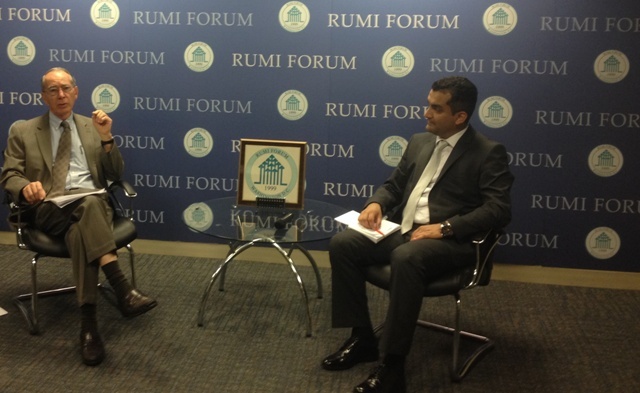 At this point in our dialogue with the Ambassador, Rasit Telbisoglu, Director of International and Academic Affairs at Rumi Forum and host of the present dialogue, posed an interesting question: how is Hizmet perceived by other Muslim communities in Africa? Ambassador Shinn stated that generally, the Muslim communities in which he worked viewed Hizmet organizations positively. However, as he worked almost exclusively in sub-Saharan Africa, this positive perception is far from representing the Muslim community. Furthermore, he detailed that more extreme groups, such as Wahhabi and salafist movements, would likely take issue with Hizmet organizations and their philosophies. In reference to the question of approval by Islamic groups elsewhere, Shinn believes that “the more interesting part of the question really applies to North Africa and the Middle East”. Ambassador Shinn observed, from his travel, that the relationships between local Muslim groups in Morocco with Hizmet was generally good, though the same relationship in Egypt was likely less warm; the Ambassador noted that it is likely that ‘sensitivities are greater’ between Hizmet organizations and the Sunni world more generally. The ambassador maintains that Hizmet is, for whatever reason, particularly compatible with sub-Saharan African populations, both Muslim and otherwise. To conclude, the Ambassador addressed a number of questions from the audience regarding Hizmet organizations in Africa. David Shinn has been teaching in the Elliott School of International Affairs at George Washington University since 2001. He served for 37 years in the U.S. Foreign Service with assignments at embassies in Lebanon, Kenya, Tanzania, Mauritania, Cameroon, Sudan and as ambassador to Burkina Faso and Ethiopia. The author of numerous book chapters and articles in academic and policy journals, he is also the co-author of China and Africa: A Century of Engagement (2012) and an Historical Dictionary of Ethiopia (2013). He serves as adviser to or on a half dozen non-governmental organization boards. Ambassador Shinn has a PhD in political science from George Washington University and blogs at http://davidshinn.blogspot.com.